UniFlow Superstructure exclusive unitized dual wall construction for superior chemical resistance (NO RUST), strength, and durability. 1 piece interior fume chamber to be glass-smooth with Varaflow baffle system & bell shaped exhaust collar. Meets NFPA-45 classification with flame spread of less than 25 per ASTM E-84. Full 28” Viewing Height provides ease of access for apparatus set-up in fume chamber. 24" interior reach in depth, and 44" interior working height. Sash is perfectly counter balanced, 3/16 tempered safety glass, coated stainless steel cable with stainless steel pulley assembly. Framed in nonmetallic PVC framing, track, and aerodynamic sash lift for ease of movement and air flow efficiency. 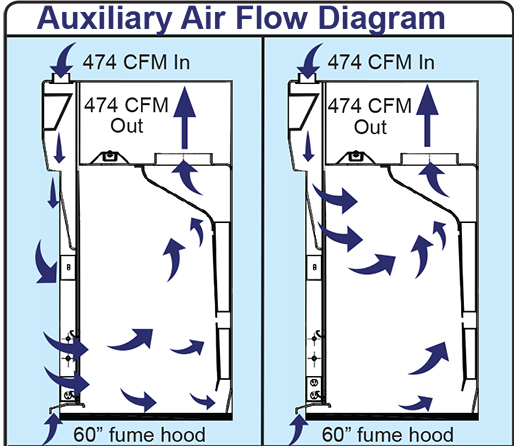 • Example: A 60” Hood with the sash 1/2 open, and an exhaust of 474 CFM combined with a 474 CFM supply of ambient air. Air flow (sash open) auxiliary make-up, air enters supply plenum and is distributed down the exterior face in through sash opening. Near zero room air. 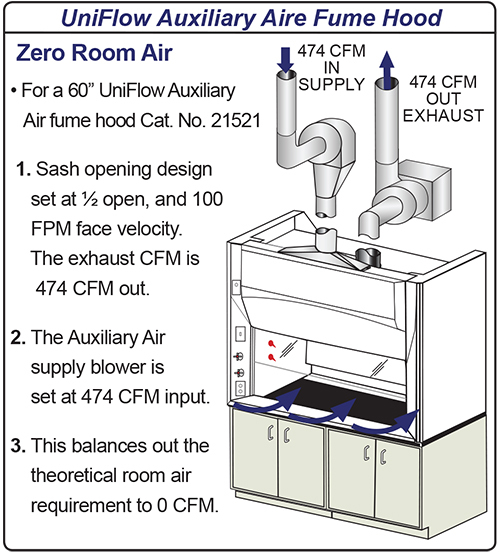 Air flow (sash closed) auxiliary make-up, air diverts from the supply plenum through the air-by-pass opening into the fume chamber. Near zero room air. 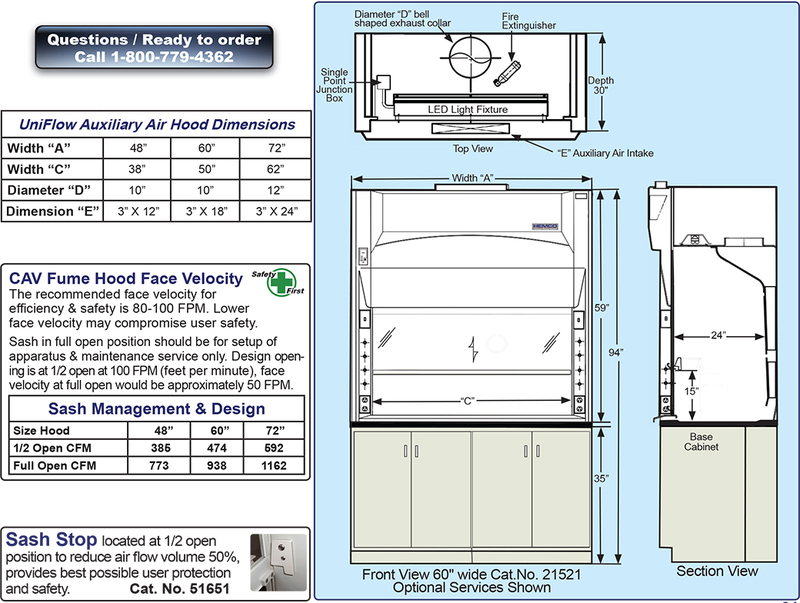 UNIFLOW AUXILIARY AIR DESCRIPTIONS Hood Depth B .Fume Hood Width "A"
1. 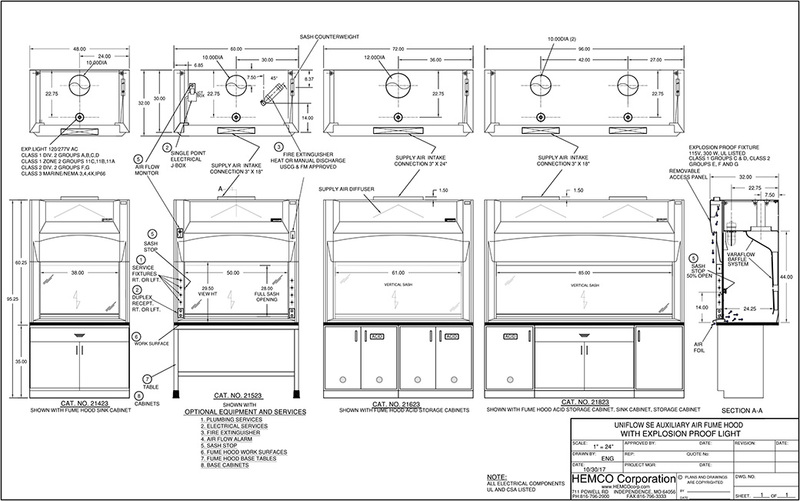 UniFlow Auxiliary Air CAV ByPass Fume Hood with Vapor-Proof Light:Superstructure to be unitized composite FRP fire resistant non-metallic construction. Integral fume chamber to be seamless glass-smooth with all coved corners with adjustable VaraFlow baffle system and bell shaped exhaust collar. Picture frame sash opening with counterbalanced clear tempered safety glass sash with chemical resistant PVC framing, track, and aerodynamic sash lift. Built-in auxiliary air supply plenum to reduce volume of conditioned air from room. Vapor-proof LED light fixture and control switch pre-wired to single point junction box,115/60Hz AC, All electrical components U.L. listed. Requires a remote exhaust blower, based on 50% supply air makeup. 30"
2. 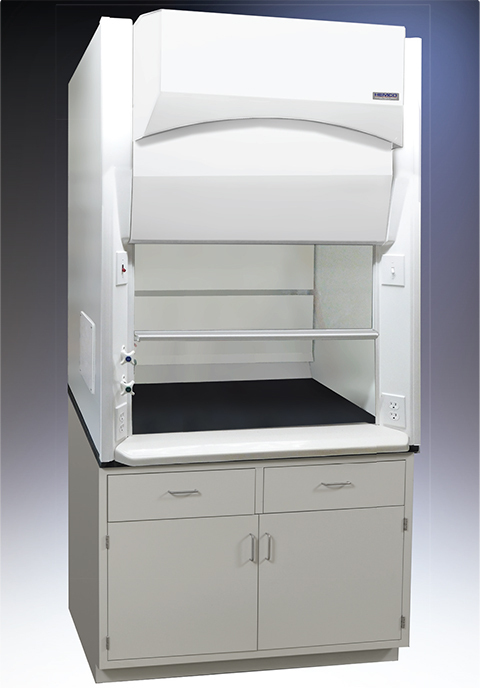 UniFlow Auxiliary Air ByPass Fume Hood with Explosion-Proof Light:Same as #1 above except equipped with explosion-proof vapor-proof light fixture Class I, Div II Groups A B C & D, Class II Div II Groups F & G electrical fixture installed but not wired, must be wired to comply with local codes. 115/230V, 50/60Hz AC. For other explosion-proof electrical options, auxiliary supply blower see below. All electrical components UL listed. 30"